In the summer of 1886, during the time I was not working at anything else, I built a boat in October the same year, in the company with five other friends, went down Puget Sounds near Cape Flattery looking for land. We saw several places which would give five to ten acres of agricultural land, but I made up my mind that I would have land enough for a farm, or none at all. The 4th of July, 1887, in company with a man, whose name I have forgotten, I took a trip southeast from Tacoma and found the Ohop Valley. 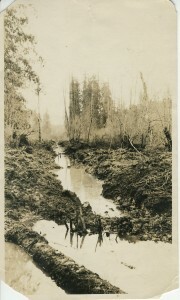 I returned to Tacoma to again work, and in August of that year, in the company with Erick Anderson, went out and started to survey from the nearest surveyed land, and ran a line down to the lower end of Ohop Lake.That was as much surveying as I could do at that time and I had to go back to work. Erick Anderson stayed at the Lake and built a shake cabin, and in January, 1888, in company with Herman Anderson and Ole Halverson, we went out to select our land. We found out on the trip that a number of Texas people had left Hillhurst for the Ohop Valley the same morning that we left Tacoma. It then became a race and I made up my mind that if the Texas people had located, we would turn back; and on the other hand, if we would be ahead of them, we would stand our ground against any odds. The morning we left Tacoma, the 6th of January, it began to snow. We camped in the woods that night and in the morning there was about a foot of snow, but we kept on going and started to survey from the point where I had left off in August, close to the Ohop Lake. We surveyed down the Valley, which was flooded, and sometimes we would get into beaver dams and in water up to our armpits. I remember Herman Anderson hesitated about going into the water for fear his watch might stop. We finally located Section 18, which would be Government land, during the snow storm, and built a little shake cabin, and when the storm was over, we saw the track of the Texas people in the snow a few hundred feet away from our little shack. They had camped during the snow storm while we were working and surveying and getting located. When these Texas people, that later became our neighbors and friends, talked about the race we had made, they said that when they found we had located they went somewhere else. We three then began to build a house for ourselves and started in to get our logs and brush for a road so we could get provisions in. 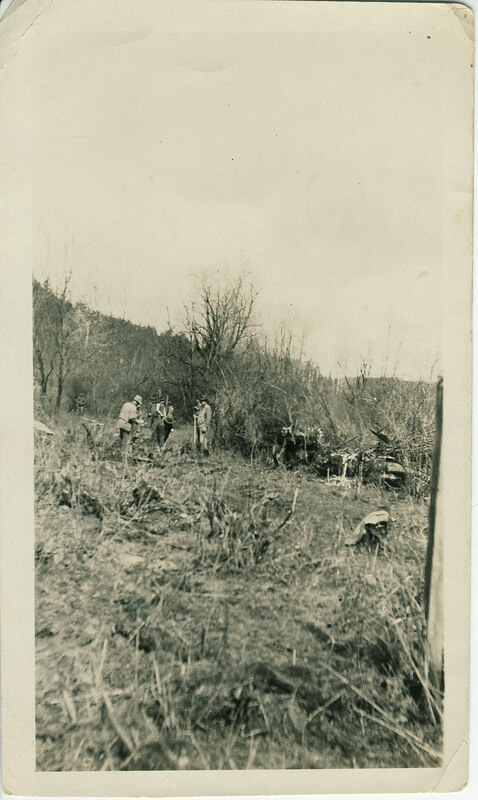 In order to get the wagons down Ohop Hill, I bought about three hundred feet of one inch manila rope and tied it to the hind axle of the wagon and lowered the wagon down as the hill was so steep that rough locks would not hold it. During the spring and summer of 1888 Mr. and Mrs. Emil Jacobson, Edwin Anderson, Peter Dabroe and Elias Hong settled in the Valley. 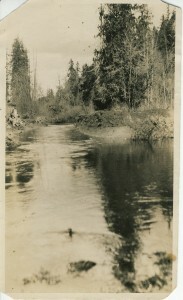 In 1889 Edward Simonsen bought out Elias Hong and Henry Kaelstad settled in the lower part of the Valley. Finally John Larsen bought Mr. Simonsen’s place and Louis Grundell bought the place of Peter Debroe, and Salve Jensen got half a section of railroad land that Emil Jacobson claimed, making 80 acres a piece. 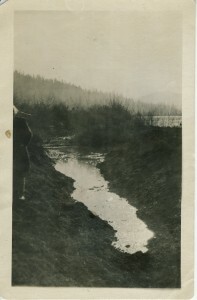 Since that time, some of the settlers above named have sold out part of their land to others so that the whole valley from Nisqually river to the Ohop Lake is all occupied. When I first came out to the Ohop Valley all the timber East of the Valley, the Mashell Mountain and clear to the Cascade Mountains in every direction was vacant and unsurveyed. Timber at that time was almost valueless, as for example, the Northern Pacific Railroad Company would sell timber land to the people at $2.50 an acre and if there was a little swamp or agricultural land on the quarter section, they would charge $8.00 an acre, showing to me that they thought the timber was of no value, but people had come in and settled on this timber land until in a couple of years every quarter section of timber was taken up as a homestead, and then after the land was surveyed and a patent secured, they sold out to the big timber companies. Now we settlers of the Ohop Valley I think had about as hard a times and showed about a much grit as the Vikings of old every showed. And in my opinion, the women who stayed by us in the early history of the Valley settling should wear a crown. They stood by us in poverty and hardship and made no complaint. In the early times, it took us three days to make the round trip to Tacoma, while now we make it in three hours. After living in the Ohop Valley for a year, I told my wife that I supposed we had made a mistake as I couldn’t see how we could get rid of the floods, as every time we had a little rain, the valley would be under water. She said she was sorry if we had to leave and asked if it wasn’t possible to turn the water of the main creek some other way. I told her I had not thought about it, but she had put an idea into my head, and I then proceeded to find the head of Ohop Creek. I found that the on the divide between Lake Ohop and Lake Kapowsin that is was just as easy for the water to run into Lake Kapowsin and down the Puyallup as it was to run down the Valley. 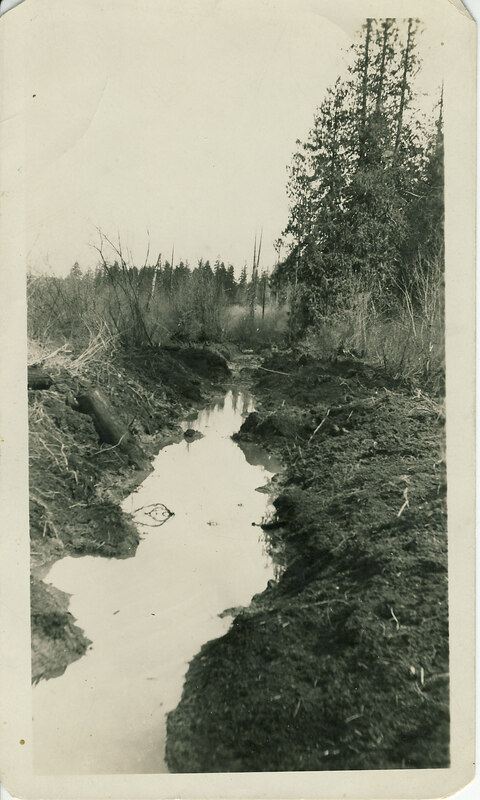 Finally, after a long struggle, I secured permission [in 1889] form the St. Paul Company and Judge Wickersham, who claimed 80 acres, to turn the main Ohop Creek into Lake Kapowsin, and all the settler in the Ohop Valley from the Nisqually River to Lake Kapowsin, twenty-two strong, turned out and helped turn the water into Lake Kapowsin. That made it possible for us to farm in the Valley, and we have recently blasted a new channel, straightening the creek through the Valley where it was crooked, so that now a flood is an exception in place of a rul. does anyone think that the creek is better now or do you think that it was better the way they had it way back then??????? I kind of like it the way it is, but I’m biased because I live on it. I have some pictures of the a “pile driving crew” in Ohop dated 1905 as well as other pictures of county roads. How do I get these to you? I love this site – so much history of the area. This has been filling in the gaps of what I know. Thank you! Oh my god, I would LOVE to include them on this site — and definitely make sure you get credit for them. You can email me direction at diane@spilledinkstudio.com. You can let me know if you need them scanned or whatever.